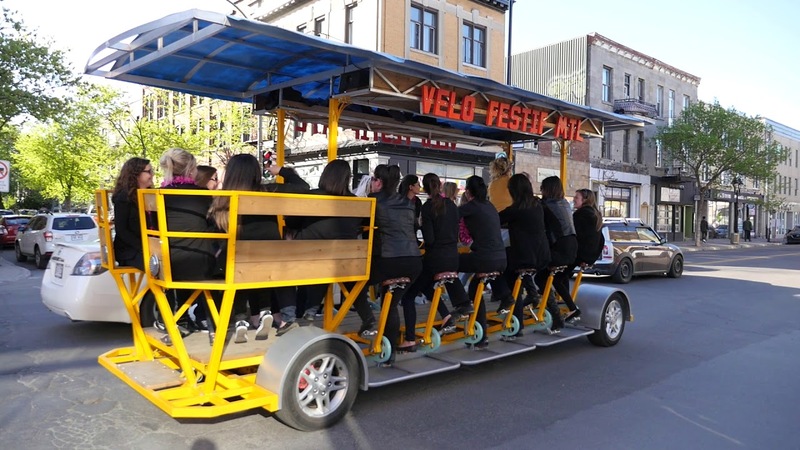 Get on board one of our giant Party Cycles and pedal your way to the most original party experience in Montreal. Where else can you get a workout, great music, dancing and discovery all in one place? Our tours bring you to some of Montreal’s trendiest neighborhoods to discover the best of what they have to offer – beer, food and fun. We offer night brew tours, afternoon events, craft beer and foodies tours. Montreal’s “Vélo Festif” offers all that and much much more. Each one of our tours is hosted by one of our energetic party managers, party associates, expert party bikers, party organizers and party master. Remember: the Party Bike is the only safe way to drink and bike! Come out for a night on the town in the only giant bike in Montreal! Express tour to start the night! It’s finally Friday. Microbrewery lovers, hop on for a tasting tour in Rosemont! Let’s unwind in Little Italy with this refreshing tour. Discover the Mile-End, one of Montreal’s must-see burrows. Time to Get Loco Motion! Velo Festif was the PERFECT activity for this bachelorette party of 12!! LOVED THIS! Marie-Chef was our driver and was so amazing!!! Recommend this to everyone!!!! Great experience!